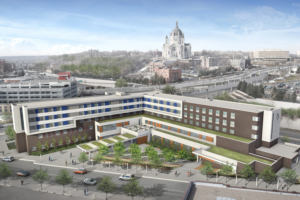 The State of Minnesota is leading the nation in requiring 70% more energy efficient State buildings in an effort to have all State construction carbon neutral by 2030. Designed to increase energy efficiency and sustainability, the State of Minnesota’s Buildings, Benchmarks, and Beyond (B3) programs were developed for and are required on State-funded projects in Minnesota. On October 26, 2017, the third annual Best of B3 Recognition Luncheon was held at International Market Square in Minneapolis to recognize the achievements of B3 program participants. The winners in each category were selected by a committee made up of staff from the CSBR and the Departments of Administration and Commerce. Best of B3 Design: Higher Ground Saint Paul overcame challenges associated with a compact urban site to effectively manage stormwater while supporting native plants and large-caliper trees. Large windows and narrow floor plates enable daylight harvesting in major program spaces, while UV-coated bird-safe glazing provides uninterrupted views to the surrounding context. 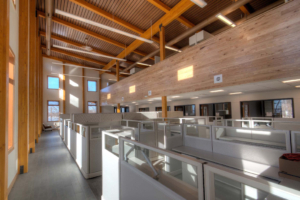 Best of Sustainable Buildings 2030: The project team for DNR Area Office, Glenwood used early energy modeling, integrative design, and a combination of passive and active strategies to design a net-zero energy building. A key strategy was minimizing air infiltration through design details and construction. 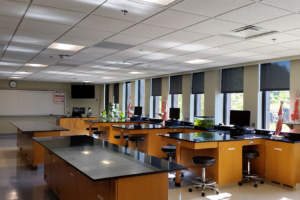 Best of B3 Indoor Environmental Quality (IEQ) – Classroom: The newly constructed Minnesota State Normandale Community College Partnership Center uses daylight, views, and personal adjustability (e.g. window shades, task lights, and furniture) to achieve an IEQ Satisfaction Score of 5.94 (on a scale from 1 to 7) based on student responses to a post-occupancy survey regarding their classroom space. Best of B3 Benchmarking – City: The City of Prior Lake tracks energy use for 7 buildings and nearly 160,000 sf. Through engagement in a Guaranteed Energy Savings Performance (GESP) program, they were able to achieve an energy use intensity that is 8% lower than the code-based benchmark, a 19% reduction from the previous year. 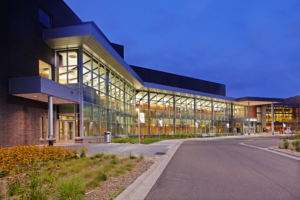 Best of B3 Benchmarking – Higher Education (tie): Lake Superior College tracks energy use for 15 buildings and nearly 400,000 sf. Through a recent effort to more actively monitor and manage energy use, they were able to achieve an energy use intensity that is 16% lower than the code-based benchmark, a 10% reduction from the previous year. Best of B3 Benchmarking – Higher Education (tie): Minnesota West Community & Technical College – Worthington Campus tracks energy use for 12 buildings and nearly 170,000 sf. 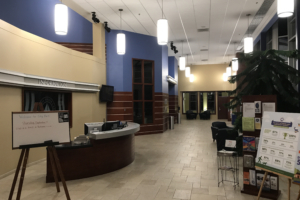 With insight from a 6-month Building Operator’s Certification program, the campus was able to achieve an energy use intensity that is 18% lower than the code-based benchmark, a 9% reduction from the previous year. 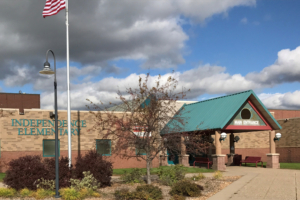 Best of B3 Benchmarking – Public Schools: Big Lake Schools tracks energy use for 6 buildings and nearly 750,000 sf. 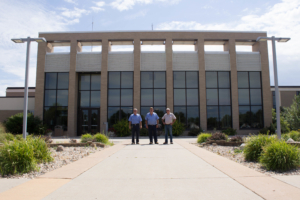 With a new facilities manager ensuring that temperature setpoints and equipment schedules match actual building operations, the District was able to achieve an energy use intensity that is 24% lower than the code-based benchmark, a 25% reduction from the previous year. 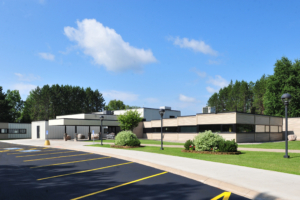 Best of B3 Benchmarking – State Agency: The Iron Range Resources and Rehabilitation Board tracks energy use in 6 buildings and nearly 115,000 sf. Through energy efficiency strategies ranging from replacing windows to adding motion-sensing thermostats, the organization was able to achieve an energy use intensity that is 5% lower than the code-based benchmark, a 10% reduction from the previous year. 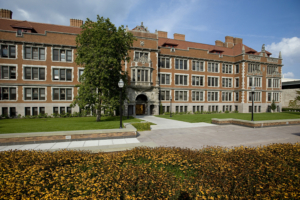 Best of B3 Leadership – Organization: The University of Minnesota, Twin Cities has completed B3 Guidelines design tracking on 5 new construction and renovation projects, and uses B3 Benchmarking to track their energy use in 222 buildings and nearly 26 million sf. The organization’s commitment to environmental protection throughout the lifespan of their facilities is reflected through their collaboration between departments, their Sustainability Design Standards, and their support for project teams and facilities managers working on their campus. The Best of B3 awards are given to organizations and projects that have shown leadership in improving their sustainability through their participation in the B3 programs. Best of B3 Design finalists are selected from among all B3 Guidelines projects based on timely submission of B3 Guidelines documentation, predicted non-energy sustainable performance (water efficiency, biodiversity, sustainable materials, etc. ), and number of optional guidelines pursued. Best of SB 2030 finalists are selected based on their design energy use intensity as compared to their SB 2030 Energy Standard. Best of B3 Indoor Environmental Quality (IEQ) finalists are selected based on achieving high levels of occupant satisfaction in the Sustainable Post-Occupancy Evaluation process. Best of B3 Benchmarking finalists are selected based on year over year improvement in their benchmark ratio, an indication of improved energy efficiency compared to code-based benchmarks. The Best of B3 Leadership – Organization award is given to an agency or organization that demonstrates high performance in the B3 program across a portfolio of projects, and shows a commitment to the advancement of sustainable design and operations. Finalists are selected based upon the agency’s support of the program, timely submissions from their project teams and the limited use of variances.